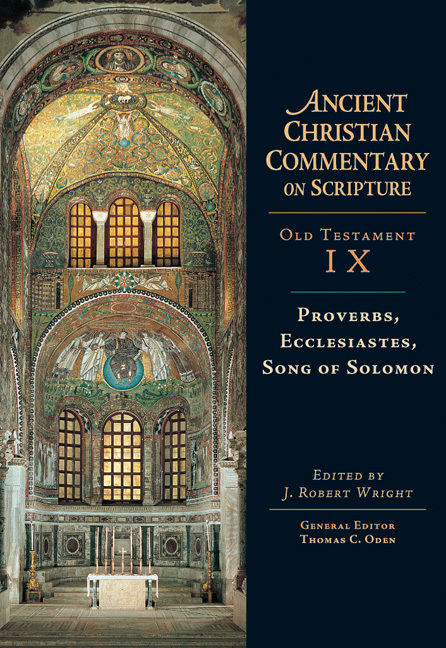 Among the Wisdom Literature of the Old Testament, Proverbs, Ecclesiastes and the Song of Solomon were all thought by the early church fathers to have derived from the hand of Solomon. To their minds the finest wisdom about the deeper issues of life prior to the time of God's taking human form in Jesus Christ was to be found in these books. As in all the Old Testament they were quick to find types and intimations of Christ and his church which would make the ancient Word relevant to the Christians of their day. This volume edited by J. Robert Wright thus offers a rich trove of wisdom on Wisdom for the enrichment of the church today. J. Robert Wright (DPhil, Oxford University) is St. Mark's Professor of Ecclesiastical History at General Theological Seminary in New York, New York. A life fellow of the Royal Historical Society (London), he serves as the historiographer of the Episcopal Church. He has written or edited several books focused on history and spirituality that seek to recover the ancient heritage that all Christians have in common, including Readings for the Daily Office from the Early Church as well as Proverbs, Ecclesiastes, Song of Solomon (ACCS). His articles have been published widely in journals such as Studies in Church History, The Lamp, Anglican Theological Review, The Messenger, Conversations, Journal of Ecumenical Studies, The Living Church, The Anglican, and Ecumenical Trends. Frequently Wright is featured and quoted in the New York Times and elsewhere as an authority on Anglican/Episcopal history and doctrines as well as on ecumenical matters.